This Sitemap will allow you to navigate to possibly all the pages of the website of RTSoftwares. The Website offers many software downloads such as Turn Off Monitor, Alarm Clock, Desktop Clock, Mouse Locking Software, Software to Block Website and many other Software Downloads. Computers consume good amount of energy, how about letting them save energy as well. There are several ways by which your computer / computers in a network can save energy. Download energy saving softwares. Softwares to help computers to save energy, reduce energy / power bill for good. 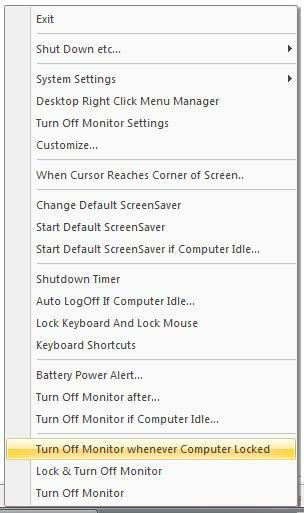 Windows Management, Multi Monitor Useful functions, and other add ons for the Turn Off Monitor Utility. Lock Computer and let us save energy. Software Update : Free Software Update. Clock Utility to Display World Time On Desktop. Turn Off Monitor/Turn Off Laptop Monitor,ShutDown,Monitor Off,Start ScreenSaver and more. Download Software to Start Default ScreenSaver,Preview ScreenSaver..
Helper/Alternative if ScreenSaver Not Working or Monitor won't turn off. Convert Text to speech, Text to .wav, and more. Add/Delete Menu Items in Desktop Right Click Menu. Get information about Text to Speech Voices Now. Automate Mouse Click using System Wide Hot Key. Work Easily with Multiple Monitors. Find Duplicate Files, Interact with Windows Explorer and much more in this Duplicate File Finder Software Utility for Windows Computers. Explore List of Files in any Selected Drive or Folder, Export List of Files to a Text File and much more.